All too often in our efforts to learn an EDA tool, students get bogged down in the libraries and the general tool methodology. When following a tutorial, the schematic is boiled down to a place where we simply place parts and connect them together. For introductory purposes, this will get us to the PCB layout. However, there a lot of capabilities that not shown or used that can make the tool more efficient. Watch the brief video on the highlights of this course. This 1-day training was designed to show you the ins and outs of the Altium Designer schematic editor. This includes placing schematic components from various libraries sources into the schematic editor, connecting the components throughout the schematics through various nets, netlabels and ports primitives, and checking the design for errors and warnings. This training will also demonstrate how PCB footprints are linked to the schematic components, as well as recommendations for how and which parameters to use to let Altium Designer create the bill of materials for you. For the purposes of creating manufacturing document, this training will show you how to generate the necessary output files that are rendered from the schematics (BOM and .PDF) and how to make use of the documentation batching capability in Altium Designer known as the Outjob file. The course concludes with a study of how repeated circuitry is implemented in Altium Designer (also known as multi-channel design) and introduces you to the self-study resources available for simulation and signal integrity tools in Altium Designer. Whether you are new to Altium Designer or have a few boards under your belt, this training was created for everyone who uses the Altium Designer schematic capture. For the beginners, you will gain proficiency. For those who are proficient, you will gain efficiency. With Altium Designer, if you understand the methodology of the schematic capture tool, you will have a good foundation for using the PCB layout editor. "Erich was an incredible and knowledgeable instructor for the Altium Designer Boot Camp. He did a great job of keeping us engaged and developing a lesson plan which showed us how to develop a PCB project from beginning to end. Even though there were different levels of Altium experience within the students, Erich did an excellent job of tailoring the class on the fly for each of us." "Altium Designer 18 like many CAD tools in its price range has many complicated features that most designers will never use, but with this class I feel confident that my learning curve will be quicker and easier." 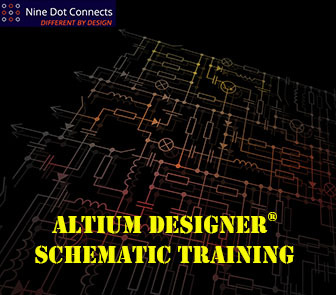 "Training on Altium Designer with Nine Dot Connects is always a truly enlightening experience. Their comprehensive, hands-on approach ensures that you immerse yourself into some of the most advanced topics of Altium. The free webinars offer critical information and design techniques that are invaluable to anyone wishing to expand their knowledge of Altium. Their highly proficient and adept staff provides you with the knowledge and wisdom you need to tackle today's electrical design challenges. I highly recommend training with Nine Dot Connects!" "We first worked with Nine Dot Connects via their Altium Designer Boot Camp course. This course was both informative and practical. The instructor gave us a lot of advice that only a seasoned veteran of PCB design and Altium could provide. We also contracted with Nine Dot Connects for PCB layout services. The work was done very quickly and with high quality. I can wholeheartedly recommend them for both design and layout. Thanks to their services we have been able to keep our project on schedule." Timothy Benson - EE, Xylem Inc.
"Dan performed training for 5 people for three days at our facility, and it was absolutely worth it. By the end of the third day, all persons under training were capable of taking a design from a sketch to a PCB layout. The training was absolutely worth every penny, and Dan’s industry knowledge and expertise in PCB design was the key to this success."